Genius Idea for Recipe Organizing Using Washi Tape! Recipe organizing using washi tape. When listing things that make me happy, I always include stickers, colored pens, and washi tape. In fact, just the other day, I told my mom I probably would have done my homework without a fuss if I had been allowed to use colored pens, stickers and washi tape to complete it. If you aren’t familiar with the joys of washi tape, you can find it at any craft store or office supply store. Washi tapes comes in wide range of colors and patterns. However, the true draw to washi tape is its level of stickiness. The tape sticks great but is also easy to peel off. Washi tape is stickier than a post-it note but not as sticky as wrapping tape. What that means: washi tape is easy to apply, but if you change your mind, you can easily peel it off. Which is why washi tape is a fun and colorful tool for organizing your recipes. If you cook from multiple cookbooks, how do you mark the recipes that you have deemed “Family Favorites”? You know, those recipes you want to make time and again because they are easy, economical, and everyone loves them? 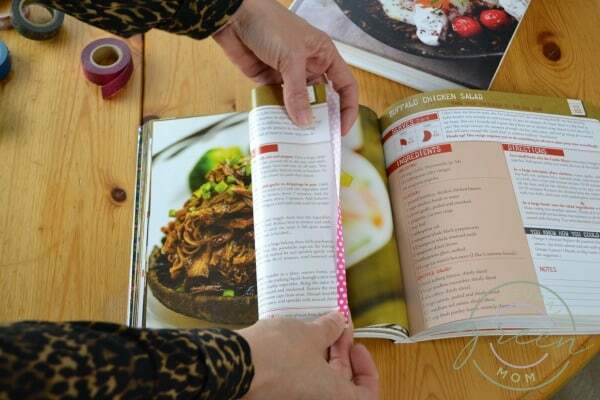 Using a strip of washi tape, you can easily line the edge of a cookbook page making it easily identifiable as a favorite recipe. Watch the Recipe Organizing Using Washi Tape video instructions or continue on to read for step-by-step instructions. Flip to the page you want to mark to be able to find it easily. Next, grab whatever color washi tape you’d like. I’ve chosen to use random colors. However, you could pick colors based on category. For example: All main dishes are marked with a blue tape. All salads are marked with a green tape. And so on and so forth dependent on your level of organization. Make sure you washi tape isn’t covering any of the instructions, then fold the tape over the edge of the page to mark. Washi tape is easy to reposition if you didn’t get it straight, or accidentally covered any words. Super simple, right? An easy, bright, and colorful way to take cookbook recipe organizing to the next level!